Page compiled by: Bioversity International/ILRI, Addis Ababa, Ethiopia (Alexandra Jorge); ILRI, Addis Ababa, Ethiopia (Jean Hanson) including information extracted from: Engels JMM, Visser L, editors. 2003. A guide to effective management of germplasm collections. IPGRI Handbooks for Genebanks No. 6. IPGRI, Rome, Italy. Characterization is the description of plant germplasm. It determines the expression of highly heritable characters ranging from morphological or agronomical features to seed proteins or molecular markers. Characterization of germplasm is essential to provide information on the traits of accessions assuring the maximum utilization of the germplasm collection to the final users. The recording and compilation of data on the important characteristics which distinguish accessions within a species, enables an easy and quick discrimination among phenotypes. It allows simple grouping of accessions, development of core collections, identification of gaps and retrieval of valuable germplasm for breeding programmes, resulting in better insight about the composition of the collection and its genetic diversity. It also facilitates a check on the trueness-to-type of homogeneous samples, allowing detection of misidentifications or duplicates and indicating possible errors made during other genebank operations. This is also important for the case of in vitro collections, to monitor the genetic stability of these collections that are susceptible to somaclonal variation. It can be carried out at any stage of the conservation process, as long as there are sufficient numbers of seeds or plant materials to sample. It should be done as soon as possible to add value to any collection. It is, however, very time consuming and expensive and therefore often delayed or done during regeneration in many genebanks to reduce costs. Normally it requires growing a representative number of plants (taking a sample from previously conserved seeds or plant tissue) in the field using a statistically sound replicated design during a full growing cycle, recording characters that are highly heritable (not much influenced by the environment), easily visible to the eye and expressed in all environments. A minimum of three replicates and preferably four with data taken from at least 10 plants across replications has been shown to be statistically acceptable for some crops. Care should be taken to select a site where the species is adapted and traits will be expressed. 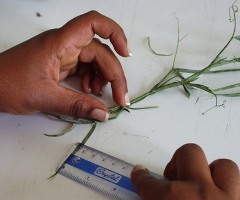 Measurements can be made at the plant level to capture the information about the variability between plants of the same accession. Most genetic resources collections are made up of population or landraces which are genetically variable. It may therefore be necessary to collect data at the plant level, rather than at the plot level, because knowledge of the average value of a descriptor for an accession as a whole is not always sufficient. In order to facilitate standardization of information obtained during characterization, Bioversity International has been coordinating the development, publication and updates of various plant descriptor lists in close cooperation with crop experts and genebank curators (see also the crop descriptors on the Bioversity website by clicking here). There are descriptor lists developed for more than 90 crops. A set of morphological descriptors can be used to describe the phenotype. Plant, stem, leaf, flower, pod and seed traits can all be scored or measured and expressed in numeric values. Descriptive traits such as flower colour can be expressed as a numeric value by using a standard colour chart. The descriptive traits used will vary with the species. Lists for common crops are available on the Bioversity website. Guidelines are also available for developing descriptors. 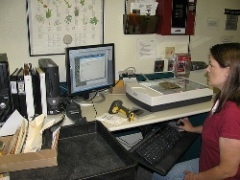 Herbarium samples are a good record of variation in a species and with care can be kept for many years and used for rechecking traits after the material is removed from the field. Sufficient detail should be captured to taxonomically identify the plant and demonstrate the traits that show variation. Collect plants with leaves, flowers and pods, also roots if plants are small. Spread plants open before pressing and arrange leaves and flowers to show both sides or any specific traits. Sufficient detail should be captured in images to taxonomically identify the plant and demonstrate the traits that show variation. The images can be stored in a database linked with the morphological data. Take images for character(s) which may be difficult to describe verbally. Images of whole plant, racemes (if applicable), flowers, pods and seeds. Nutritional traits which include food or feed value are important for many vegetables, fruits, and forages. Cooking or utilization traits such as toxicity or flavour are important for many crops and may be part of the set of traits characterized to provide important information on potential use. New methods have made molecular analysis and genotyping useful techniques for studying diversity. Samples of leaf are usually collected from replicated trials. A variety of molecular techniques are used, including cytological markers, biochemical markers and molecular genetic markers such as SSR, EST-SSR, AFLP, RAPD. Their choice depends on the stage of research into molecular methodologies for the crop, facilities and expertise available in each genebank. Descriptors are available to describe a genetic marker technology and collect information about genetic markers in crops that are standardized and replicable. The recording and compilation of data on the important characteristics which distinguish accessions within a species is just the first step in characterization. The analysis, interpretation and presentation of the data are key to sharing information about the diversity in the collection. There are many statistical packages available for data analysis that can be used. An analysis of variance can be done on single trait data. However, in many cases data is not normally distributed and must be transformed or analysed with statistical packages that handle this type of data for single traits. Multivariate analysis is used for data on multiple traits using using a range of different cluster, discriminant or principal components analysis methods to look for natural groupings of accessions. Once the data is collected it can be used to describe the diversity within and between accessions. The simplest use of characterization data is to identify accessions with specific traits to make selections for further research or plant breeding. The data can also be used to identify groups of morphologically or genetically similar accessions . The descriptive data can also be used together with spatial analysis software to match traits with collection sites and environmental adaptation. Separate the accessions into meaningful groups using a hierarchical procedure; separating the wild from the cultivated species, and using taxonomy and knowledge about domestication, distribution, breeding history, cropping pattern and utilization. Create groups of similar accessions from characterization data using multivariate analysis, genetic markers, agromorphological characteristics or other characters, using a range of different cluster, discriminant or principal components analysis methods. The methods can be used individually or together and the choice of method will depend on the information available, amount and type of genetic diversity in the collection and the crop. The final step in establishing a core collection is choosing the actual entries from each group. This can be done randomly or systematically, based on some formal analytical procedure or on pragmatic considerations such as amount of material or information. Bioversity International. 2007. Guidelines for the development of crop descriptor lists. 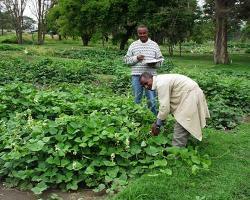 Bioversity Technical Bulletin Series. Bioversity International, Rome, Italy. Available here.Engels JMM, Visser L, editors. 2003. A guide to effective management of germplasm collections. IPGRI Handbooks for Genebanks No. 6. IPGRI, Rome, Italy. Available in English (1.4 MB) and Spanish (1.5 MB). FAO/IPGRI. 2001. Multi-Crop Passport Descriptors. FAO and IPGRI, Rome, Italy. Available in English, French and Spanish. IPGRI. 2001. The design and analysis of evaluation trials of genetic resources collections. A guide for genebank managers. IPGRI Technical Bulletin No. 4. International Plant Genetic Resources Institute, Rome, Italy. Available here. Hodgkin T, Brown AHD, van Hintum ThJL, Morales EAV. 1995. Core collections of plant genetic resources. Wiley and Sons, UK. van Hintum ThJL, Brown AHD, Spillane C, Hodgkin T. 2000. Core collections of plant genetic resources. IPGRI Technical Bulletin No. 3, International Plant Genetic Resources Institute, Rome, Italy. Available here. Johnson RC, Hodgkin T. 1999. Core collections for today and tomorrow. International Plant Genetic Resources Institute, Rome, Italy.de Vicente MC, Metz T, Alercia A. 2004. Descriptors for genetic markers technologies. International Plant Genetic Resources Institute, Rome, Italy. Available here.